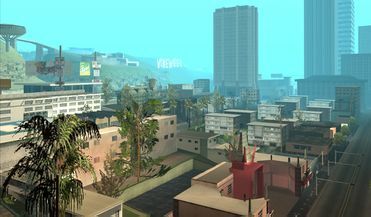 Temple, Los Santos, as viewed to the northeast in GTA San Andreas. Temple is a district of Los Santos, San Andreas. 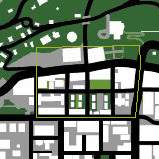 This middle-income neighborhood is surrounded by the districts of Downtown Los Santos, Market, Mulholland and Vinewood. There are several housing complexes and several businesses located here. There appear to be two gangs located in the neighborhood around the time of Carl Johnson's return to the city in 1992, one being the Temple Drive Families (formerly allied with the Grove Street Families), and the other being the Temple Drive Ballas. Whether or not these groups were at one time one single gang that divided or if the Temple Drive Ballas are just a group from another Ballas-controlled neighborhood is unknown. When the player commits a crime in the Temple district, the police radio announcer can be heard referring to the location as Sunnyside. This page was last modified on 20 December 2012, at 21:10.